Somewhere near the starting line, Tish, the GRIT CEO, uses the light from her headlamp to tension the chains on a fleet of brand-new Freedom Chairs. Their specialized tires are clean, their cushions are bone dry, and they have no idea what’s about to hit them. And suddenly -- from speakers you hadn’t even seen yet -- comes the unmistakable guitar of AC/DC’s “Thunderstruck.” Tish tensions the final chain. People emerge around you, chanting in time with the song, “thunder,” and no matter where you came from, no matter how you plan on navigating the course, you know one thing: It’s Spartan time, baby. 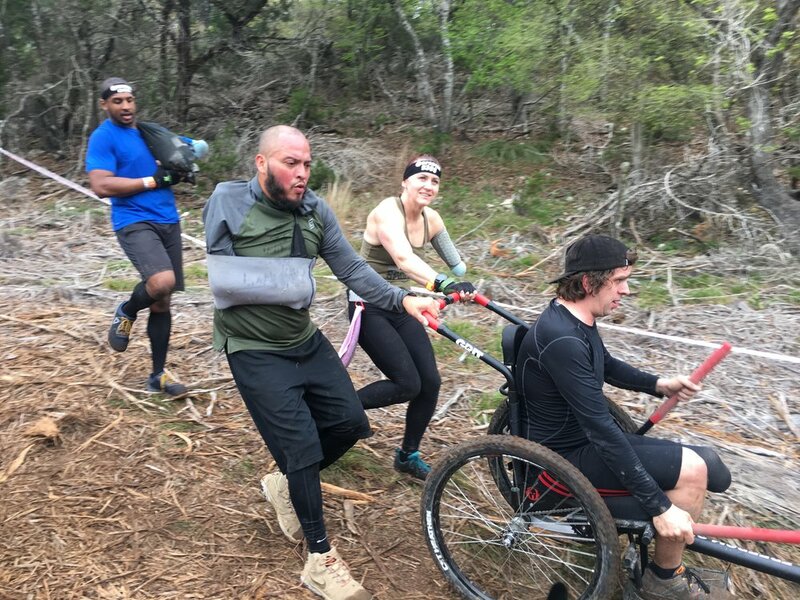 In March 2019, adaptive athletes from around the world collided to partake in the first-ever Spartan Para-Elite Training event, outside San Antonio, Texas. GRIT joined a massive unit of athletes and volunteers to travel the course and discuss best strategies for the walls, nets, wires, and hurdles on which the para-elite athletes would compete. Here’s a bit about what went down. What Is a Para-Elite Training Event? The purpose of a Para-Elite Training Event is to familiarize elite adaptive athletes with the Spartan course, the Spartan obstacles, and the teammates on whom they’ll rely to secure the cash prize at the Para-Elite Finals later in the year. In 2019, all Para-Elite Training Events will be held at Spartan Honor Series Races (click here to see the full list). Spartan Races are inherently difficult, sure, but how do you navigate the barbed-wire crawl in a wheelchair? What’s the best way to do the rope climb with one leg? One arm? What do the rules say about assisting each other through obstacles? On March 2019, GRIT joined Spartan, Oscar Mike, Operation Enduring Warrior (OEW), Adaptive Training Foundation (ATF), San Antonio Amputee Foundation, Be More Adaptive, You Adapt, and a small army of para-elite contenders to answer the above questions and more. What Is the Spartan Para-Elite? All Para-Elite Teams are composed of four adaptive athletes, each of whom is given a numerical rating based on level of ability. The collective numerical rating of each team must fall within a certain range, to give every team as fair a chance as possible. The Para-Elite Training Events happen year-round, across the country--every athlete who wants to compete for the cash prize at the end of the year must attend at least one training event. The courses, obstacles, and the burpee penalty are identical to those of other elite Spartan Races. More on the specific rules here. After the first Para-Spartan Elite Race in November 2018, which was televised by ESPN, Spartan made a few updates to the Para-Spartan rulebook. One of the most notable updates was that starting in 2019, every team must incorporate at least one wheelchair athlete. As the official all-terrain wheelchair of the Para-Spartan Elite, this means that every team must incorporate at least one GRIT Freedom Chair (hey, that’s us!). At GRIT, we’ve designed a model of the Freedom Chair specifically for Spartan Races. It comes with specific reinforcements to the fork and seat pan, a series of built-in accessories crucial to racing, a special wheelset for tough terrain, and a Spartan decal set to have the athletes rolling in style. The Freedom Chair: Spartan has been trial-tested as the best all-terrain wheelchair for a rigorous test like a Spartan Race. It serves as the nucleus of each Para-Elite team, around which the other athletes circle to complete the race; it also defines wheelchair athletes as integral components of elite, athletic teams. If you were at the Don Strange Ranch that day, you knew exactly when the para-elites headed to the starting line. The group of athletes, volunteers, and organizations had an unmistakable force and sheer volume (there were a lot of us). We piled toward the starting gate, and after an impassioned starting speech by a Spartan official and the three customary AROOs, we took to the course. Sharp, slippery declines quickly challenged the athletes and required coordination, communication, and a constant awareness of one’s surroundings. The athletes had to adjust immediately -- to the other racers around them, to the terrain, and to generally navigating every step as a unit. The GRIT Freedom Chair was an important element here, as mastering its nuances and transportation could make the difference between a winning and losing team. The shift of a rider’s weight, the maneuverability during steep declines, the team effort of ascents, and the allocation of pushers and pullers were all important considerations to make. Now, we know we’re a little biased here, but the athletes in the Freedom Chair crushed it. Honestly, at times, it was hard to keep up with them -- they all but flew over the rocks, roots, and mud -- especially after the athletes got used to the lever-pumping action and working together. Before long, athletes worked efficiently -- non-wheelchair athletes would assist the wheelchair athlete to an obstacle, sprint around to the other side with the Freedom Chair, and sprint back to do the obstacle themselves. On the sections between obstacles, Freedom Chair athletes drove hard into the levers to propel themselves and their team forward as quickly as possible. Everyone worked in unison, as will be required in the elite finals later this year. There were a few moments (like the deepest parts of the river) where the chair had to be lifted. This gave athletes the chance to coordinate in teams of four how to do this -- where to hold the chair, how to distribute the weight across each athlete, etc. Again, this is a crucial element to the elite races, and the slower pace of the Para-Training Event allowed athletes to master their methods. A few obstacles into the course, we huddled up as a group as Oscar Mike and OEW established a very important rule: If you do not qualify as an adaptive athlete, do not get in the way. Do not physically assist. It may be easier, they said, for an able-bodied volunteer to carry someone over an obstacle, but that would be counterproductive to the whole goal of the event. This was a serious and important rule. The athletes were there to replicate the experience of a Para-Elite Spartan Race, which means no able-bodied help -- and no help from anyone beyond the members of the four-person group. From that huddle onward, the course opened up..
As we approached each obstacle -- whether the Vertical Wall, the Hercules Hoist, or the ever-famous Fire Jump -- each athlete chose three others to support and be supported by. While the teams of four rotated throughout the training event, only four people worked with each other at a time. All other groups and volunteers were there to offer suggestions and verbal assistance, (and document the crazy athleticism via social media), but the rest was on the athletes. The Para-Spartan Training Day revealed many athletes as experts -- those who were immediately and universally admirable by their physical ability, mental rigidity, and patient support of the others around them. These experts were critical to the success of the group. As Para-Spartans compete in more races and training events, the leaders emerge, guiding new athletes through the various tests of a Spartan Race. These leaders -- like Michelle Burnette, Jeremy Ogle, Caitlin Conner, and Trevor Battah -- took pause at each obstacle when other athletes required it. They rushed no one and they encouraged everyone, giving pointers on the appropriate leg-wrapping technique of the climbing rope, the best single-arm method to carry the Atlas Stones, and how to conquer the rings regardless of how many limbs you have available to you. The guidance and leadership these veteran athletes provided was crucial, but many of them are leaders in the adaptive community at large. Whether through organizations like Be More Adaptive, You Adapt, or elsewhere, these leaders embody the selflessness, the no-excuses perspective, and the absolute grit required by all Spartans. 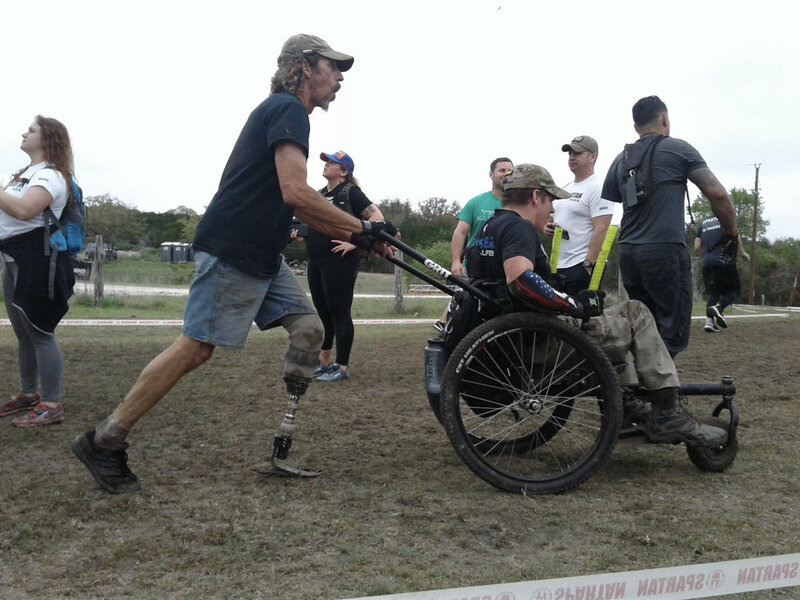 The San Antonio Para-Training Event was in some ways a “first.” It was the first official para-training event for anyone, the first Spartan Race for many, and the first time using a GRIT Freedom Chair for some. Some athletes successfully topped obstacles they hadn’t mastered before, and all fearlessly helped others do the same. At GRIT, we are, of course, totally thrilled with the GRIT Freedom Chair -- it remains unmatched in its ability to help athletes through Spartan courses, in its maneuverability during the race, and the ease of transport to and from the race. It allows the wheelchair athletes themselves to contribute an enormous amount to the success of their teams and also facilitates the support of the team to get through the race. It more than handled the difficult terrain, the vigorous use, the water/muck/sand elements, and is more than ready for whatever else Spartan wants to throw at it. After all this, though, the GRIT Freedom Chair is nothing until someone gets in it. So, what are you waiting for, spartan? Interested in participating in a spartan race?